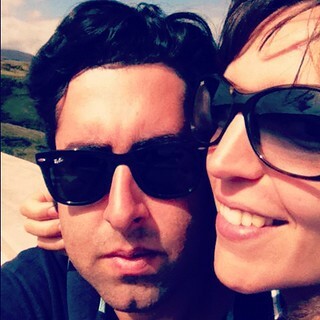 We are Ana and Filipe, and we’re in love with the Azores and especially with Pico Island, where we have found the perfect getaway. Ana works as a Barista in Lisbon and has her roots in Pico Island. Casinha da Júlia (Júlia’s Little House) was built by Ana’s great-grandparents in 1900, so she has is a very close connection to the island. Filipe works as a Food Photographer and is deeply fascinated by the sea. In Pico he found the perfect place to do one of the things he loves most, diving. Together, we are trying to recover and maintain the memory of a historic house. It remains a family project that we’re happy to make available to anyone who, like us, enjoys the sea, the mountain and Pico Island! A typical Azorean house built at the end of the 19th century by a small farming family of little means. Júlia’s Little House is located high on a slope within the civil parish of São Caetano on Pico Island, next to the regional road. It is surrounded by other houses, which means it is integrated in neighbourhood life. The house has a historic atmosphere about it as a result of the several generations that have lived there and enjoys a unique location, marked by the powerful presence of the mountain and the limitless blue sea. The house has been modified several times over the years, slowly catching up with the comforts of modern living. The last of such refurbishments was carried out earlier this year, where the bedroom and living areas were totally renovated, making them more functional and comfortable. The house can accommodate 6 people and is split into two levels. On the upper level, you can find the kitchen and bathroom, and an open-plan space with a sofa-bed and a bedroom with a double bed. The lower level has a bedroom with a double bed, a small office space and a storage area. The two levels are connected by an internal staircase at the centre of the living area. The lower level enjoys direct access to the outdoor patio area, towards the front of the house. The patio has a large dining table, chairs and a parasol. There is also a barbecue area with wooden stools, where you can cook a meal or simply enjoy a warm fire on a summer’s evening. We have plenty of firewood that you can use. The kitchen is equipped with all the essentials (including an oven) and includes a small dining area. The bathroom is a good size; the shower is a little smaller than we would like but it is perfectly functional. Despite the fact that this part of the house is relatively modern, we hope to make it more functional in the near future. We have made a personal choice not to have a microwave, a TV or Internet access in the house. However, there are two cafés nearby with Internet access and TV. For further information and booking, please send us an e-mail.